Do you consider yourself a dog person or a cat person? A recent poll called the Gosling-Potter Internet Personality Project, headed by psychologist Sam Gosling, asked 4,500 people that question. The interesting twist on the poll was the people were asked questions about certain personality traits and not about which animal they owned! The results showed dog people were open, social and outgoing while the cat people were creative, philosophical, and nontraditional. I own both a cat and a dog and can see how one can have a few traits from each of the lists! Cali, our cat, is the newer addition to our family and she is a great cat! We love showering her with love and affection and here are just a few ways you can do the same! Attention, Attention, Attention: Cats are unique creatures and they usually want attention on their own time. When they do want attention, they will usually let you know it! Some of the ways you can show them attention is of course by petting them, snuggling with them and grooming them regularly. Cats spend almost half their time self grooming, but they also love the feel of a good brushing. It is like giving your kitty a massage! 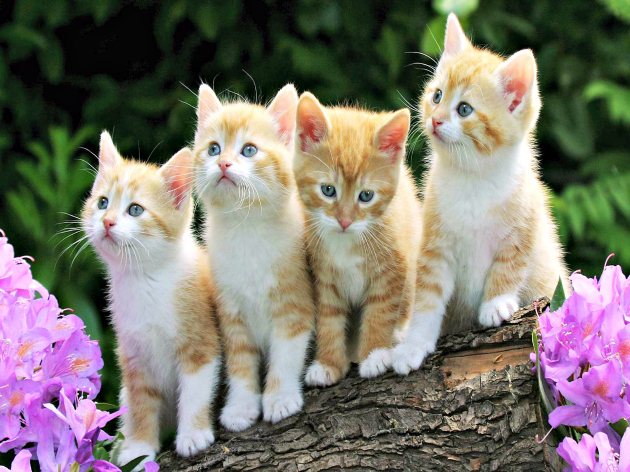 Treats: In addition to their regular feeding schedule, cats love the occasional treat. Some of the treats they like include catnip, a cold cat friendly “ice cream” treat made without milk and cream is especially nice in the warm months or a nice smelly fishy treat! Playtime: Because cats sleep so much of their time away, when they are awake, they need exercise. 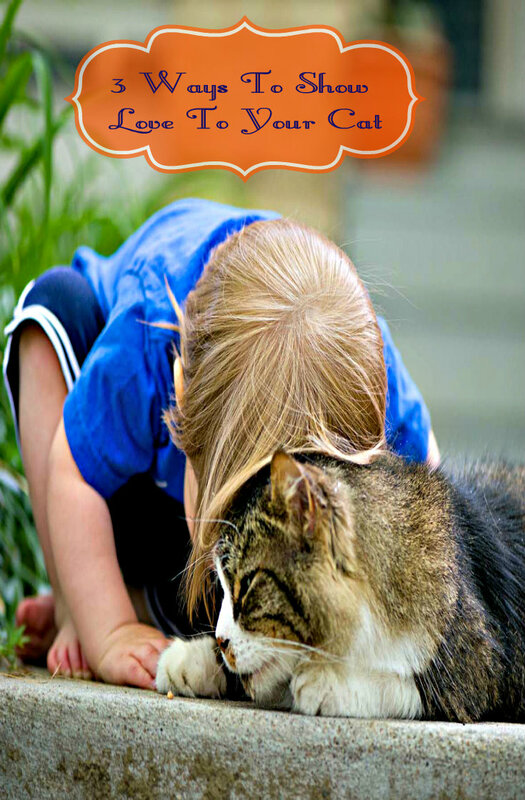 Playtime with your pet is also a great way how to show love to your cat. You can buy or make cat toys or roll a kitty ball for them to chase. When your kitty wants some alone time to play, they will love you if you provide them with something they can climb on. With the innovative Catty Stacks, you can design a climbing structure your cats will have loads of fun exploring and climbing in and out and on top of! With cats, you know they love to play and hide in boxes. This may be one of the top things you could let your kitty play with and they will love it better than anything that came in it! Bearing this in mind, it only made sense to create a box cats could play in, climb on and have a place they could make their own. 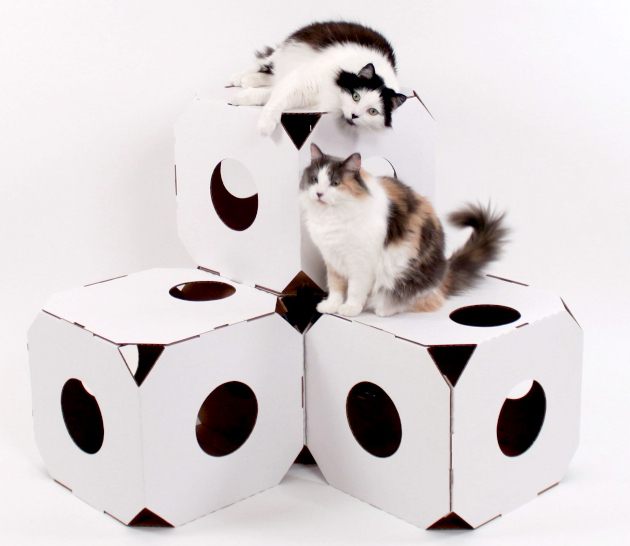 With Catty Stacks, you get a sturdier, eco-friendly and cleverly designed modular box cats love. The Catty Stacks are made from a proprietary cardboard called Corrugated Ultraboard™, which is made specifically for their construction. It is sturdy like wood but greener and more earth friendly like cardboard. The Catty Stacks are lightweight and made to stack easily on top of one another or side by side. They can be moved or rearranged to continually create a new and interesting place for your cat to explore and have fun in. You can find this modular pet furniture in 5 colors which are tinted with vegetable based ink and they can be purchased For $15 on the Catty Stacks website, Amazon and many fine pet retailers. Be sure to stay current with the latest news and deals from Catty Stacks by following them on Twitter. What is your cats name and how do you shower it with love?